Ujung Kulon has a vast array of wildlife, quite a number of which are endangered or rare. Some of the animals are so unafraid that they freely wonder in and around the tourist lodges, others are sighted almost every day, many are heard rather than seen, and some are rarely seen. The most precious of all the animals in the parks is the Java one-horned rhinoceros, the rarest large animal on earth. Once found across much of south east Asia, the first accounts of the Java rhino date back to China’s T’ang dynasty (A.D. 618-906) when Java was noted as a source for rhino horns. In Java during the 1700’s rhinos were so numerous and damaging to the agricultural plantations that the government paid a bounty for every rhino killed, bagging five hundred within two years. Ujung Kulon’s rhino population is now estimated at around fifty individuals and they were believed to be the last remaining Javan rhino in the world until a small population was recently discovered in Vietnam. However, these are so few in numbers that their viability is unlikely and so Ujung Kulon remains the last home of this magnificent pachyderm. In appearance the Javan rhino is closest to the Indian rhino, both having a single-horn and skin folds or plates but there are distinct differences between their neck plates and skin textures. The Javan rhino also has a long prehensile upper lip which extends below the lower allowing it to grasp foliage. The body shape of the Javan rhino is designed to push aside the undergrowth and only the male Javan rhino has a prominent horn while the female has a lump similar to a halved coconut. Earlier this cenntury Javan rhinos were measures as being over 170 cm. At the shoulders, more than 3 metres in length and 2,200 kg. 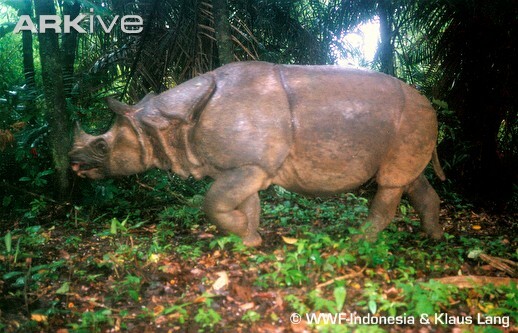 In body weight but a recent photographic survey indicates that the largest rhino in Ujung Kulon may be around 150 cm. in height. Rhinos range over a maximum distance of 15 to 20 kilometres a day in the densely forested lowlands of the Ujung Kulon Peninsula and to the east of its isthmus. They are most mobile at nights, like wallowing in mud pools and sometimes venture onto beaches and grazing grounds. Although actual sightings of rhinos are rare, their prrints and droppings are often found on the trails, sometimes unnervingly fresh. Javan rhinos are believed to be capable of running as fast as a person and so advice to visitors, should they happen to come across one, is to climb the nearest tree and take a photo - in that order. Far more obvious animals in the park are the Javan rusaa deer that freely graze arround the tourist lodgess. These are the largest of the three deer specises in Ujung Kulon. The rusa stags are at their most magnificent in the mating seaason around August to September wwhen the antlers have shed theirr velvet annd territorrial battles between the stags begin. The smaller Barking deer has a long sleek head and measures around 60-70 cm. at the shoulders. The stags have short, two-pointed antlers and tusk-like canine teeth. Their favourite habitat is low to the ground and when fleeing their white under-tail catches the eye. The smallest is the Mouse deer which measures only 20-25 cm. in height and has a reddish-brown coat with white underparts. The stag does not have antlers but instead has long curving canine teeth that extend outside the mouth. 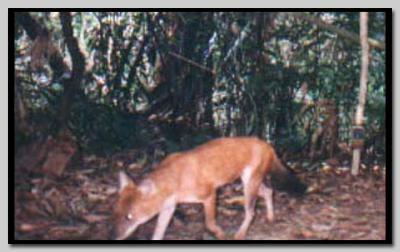 In the early years visitors to Ujung Kulon witnessed a Mouse deer ripping open the stomach of a rival during a mating fight. Their habitat is within the forest and they rarely venture onto beaches and clearings. Since pre-historic times these wild cattle have lived throughout Java and in the 17th century were used to carry loads but now the herds roam wild and are found in just a few locations throughout the island. The males have black coats while the females are usually a golden brown and both have white buttocks and stockings. Aa mature bull can measure over 170 cm. at the shoulders and although both sexes have horns, only the males are large and curved. 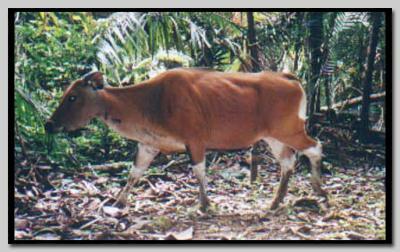 Banteng favour open grassy clearings for grazing particularly early and late in the day but also feed on the forest’s young secondary growth and are found throughout the Peninsula and southern Gunung Honje regions. Ujung Kulon has five species of primates with the brown, long-tailed, Crab-eating, macaques being the most commonly seen especially on beaches and reefs at low tide. Peucang Islands supports four separate groups numbering over two hundred individuals. The macaques’ strongly hierarchical society is based on a matriline system - daughters stay with the mother as long as they live while juvenile males usually leave the group to join another group or become solitary. Within the group structure there can be several adult males with one being the dominant but tolerant leader. Female macaques usually rank just below their mothers and, interestingly, above older sisters so that even babies from highly ranked mothers can control adult males and females. Primarily fruit eaters, the macaques’ diet includes a wide variety of food and their cheek pouches can hold the equivalent of a stomach load of food which allows for hasty food gathering to be eaten later. Each group has its own territory and although they sleep in trees they do not build nests and unlike the park’s other primates they are equally at home on the ground or in trees. Another primate, only found in Java, is the glossy blackish-brown Javan silvered leaf monkey which has long, slender limbs and tail. They frequent most regions of the park particularly the Gunung Honje Range but unlike the macaques their groups are small and usually contain one adult male, several females and their young. The rarely seen Grizzled leaf monkey in slightly heavier than the Javan silvered leaf monkey and has a grey coat, long tail and head crest. Very small populations of this extremely rare and endangered monkey live in the Gunung Payung and Honje Ranges. Also endangered is the Javan or Moloch gibbon which is unique to West Java and its habitat in Ujung Kulon is the primary forests of the Gunung Honje Range. These tail-less primates have grey fluffy coats and black faces annd make a distinctive hooting call resembling their Indonesian name Owa. Gibbons are monogamous, mate for life and live in small family grroups consisting of a male, female and one or more young. The young adults leave the group to roam the forest searching for a mate and new territory. The parks’ fifth primate is the Slow loris and being nocturnal, sightings are uncommon. Around 25 to 30 cm. in size, it has an ash-grey coat and large round eyes for night vision. The notable characteristic is its slow, smooth, perfectly co-ordinated movements which allow it to freeze in mid-movement for self protection if disturbed. Ujung Kulon has two types of wild pig, the Eurasian wild pig and the Javan warty pig. Similar in size and weight, the Eurasian wild pig sometimes has a light greyish-white stripe from the head to the chest while the male Javan warty pig has three pairs of lumps or warts on the face which can give an old male a monstrous appearance. The coat of the young Eurasian piglet has long yellowish-brown stripes and when disturbed they often make short loud grunts while warty pigs have a high pitched cry. Wild pigs are surprisingly good swimmers and have been known to cross the 700 metres channel between the Peninsula and Peucang Island. The cat family was represented by five species although the last positive sighting of a Javan tiger in Ujung Kulon was in the 1950’s and it is believed that they are now part of the long list of the world’s extinct animals. However, leopards measuring over half a metre at the shoulder and over 1.5 metres in length, number as many as sixty in Ujung Kulon and their tracks are sometimes seen on beaches and stream beds. The black rosette on their coat have background colours that can vary from a light straw yellow to orange-yellow and it is not uncommon for the leopards to have completely black coats. Fishing cats, named for their ability to scoop fish out of water, are considerably smaller than leopards but larger than domestic and the jungle or leopards cats, which tend to frequent the boundary regions of the park near settlements. Between a fox and ferret in size with short legs, long muzzle and a tail the same length as its body, the most often seen of these predators is the Common palm civet which is found throughout the park including Panatian Island. These are quite different from the domesticated village dogs seen throughout Indonesia as they are smaller, squatter, have a red-brown coat and a fox like appearance. They live hunt in packs and in 1846 there was an account of hundreds of large turtles, some of which were well over a metre in length, being over-turned and killed by a dog pack on Ujung Kulon’s south coast. Then unaccountably their numbers decreased to the point where they were never seen in Ujung Kulon until earlier this century when they again re-appeared, possibly partly due to the dwindling tiger population. Although over 250 species have been recorded in Ujung Kulon, the birds are not always easily seen as many live high in the forest canopy or are vigilant inhabitants of the dense undergrowth. However it is the constant bird calls of Ujung Kulon that contribute to the atnosphere of the forest, for seldom is the park silent. The world's vast numbers of invertebrate species, which out-number the animals by ten to one, have extremely important roles as pollinators, re-cyclers, pest controllers and generally keep the forests alive and healthy.